Third book in Taste of Romance series! 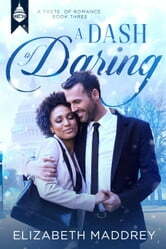 A Dash of Daring by Elizabeth Maddrey is the third book in the Taste of Romance series. This is a Christian romance series. Zach Wilson teaches math at an inner-city high school in Washington, D.C. He has been interested in dating Amy Harris (substitute teacher and after school care coordinator) for some time but she keeps putting him in the friend zone (Amy wishes to avoid dating someone who is not a part of her multi-ethnic heritage). Zach finally asks her out on a real date and Amy hesitantly accepts. This is the first of many dates. Amy, though, will have a long way to go before she is ready for a serious relationship. Amy tends to make snap judgements and jump to conclusions without hearing all the information. Amy and Zach will get to know each other better as they work on the school’s holiday program. When Zach gets an opportunity to have a job at a magnet school will it end their budding relationship (he would like to teach to students who actually enjoy math)? Will Amy be able to get over her issues to have a wonderful future? A Dash of Daring is a sweet, Christian romance novel. There is some kissing in the book and a just a hint of an engaged couple looking forward to more after they are married. The book does have a pregnancy between two teenagers in it. I liked Zach, but Amy was a harder character to enjoy. She was so quick to assume things and then would storm off (which I find annoying). It was nice reading about such dedicated teachers who enjoy their jobs. We get to catch up on the characters from the past two novels to see how they are doing in their relationships. While A Dash of Daring can be read alone, it does help to have read the first two books in a Taste of Romance series. I give A Dash of Daring 4 out of 5 stars (which means I liked it, but did not love it). I received a complimentary copy of A Dash of Daring from The Book Club Network Inc. and Elizabeth Maddrey in exchange for an honest review.